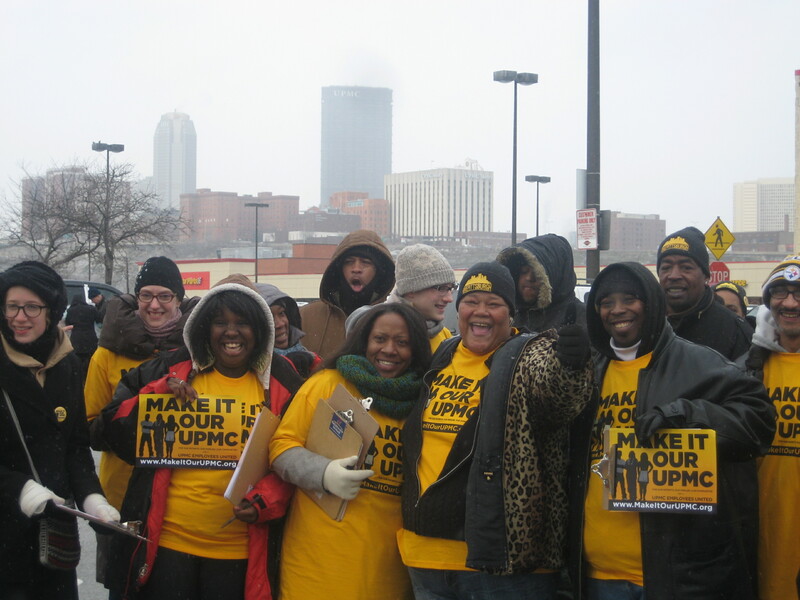 Saturday morning was cold and snowy, but after hearing from City Councilman Daniel Lavelle, Braddock community activist Pam Lee, and UPMC worker Christoria Hughes, Make It Our UPMC supporters were fired up and ready to go. Make It Our UPMC supporters gathered on Feb. 2, 2013 for a community canvass in Southside Pittsburgh to tell the public that UPMC needs to act like a real nonprofit charity. Against the backdrop of UPMC’s logo at the top of the US Steel tower, Make It Our UPMC canvassers fanned out across the South Side to sign up hundreds more Pittsburghers to help hold UPMC accountable to our community’s needs. Make It Our UPMC supporters last month marched through downtown Pittsburgh and delivered the Code of Conduct for a Strong, Healthy Pittsburgh to UPMC, Mayor Luke Ravenstahl and County Executive Rich Fitzgerald,urging them to stand with us in making UPMC put our city before corporate profits. People across the region are asking about UPMC’s role as a public charity. Does a real public charity’s CEO make $6 million a year? Does it use its tax-exempt status to enrich its real estate portfolio? Does it spend less than 2 percent of its revenue on charity care? Does a real public charity try to stop its employees from trying to have a voice on the job and create middle-class jobs for working people in region? We took those questions to our neighbors and they answered loud and clear – it’s time to hold UPMC accountable. Let’s keep building the movement to make UPMC act like a real charity. Join us as we go out again to talk to our neighbors and friends on Saturday Feb. 16 when we’ll be going to East Liberty. Stay tuned to the Make It Our UPMC facebook page for updates. Together, we can Make It Our UPMC.